It’s no secret that we’re fans of movies here on Ground Control Magazine, and with all the movies we watch, it’s really refreshing when an original one comes along. Extra points for it being independently produced. 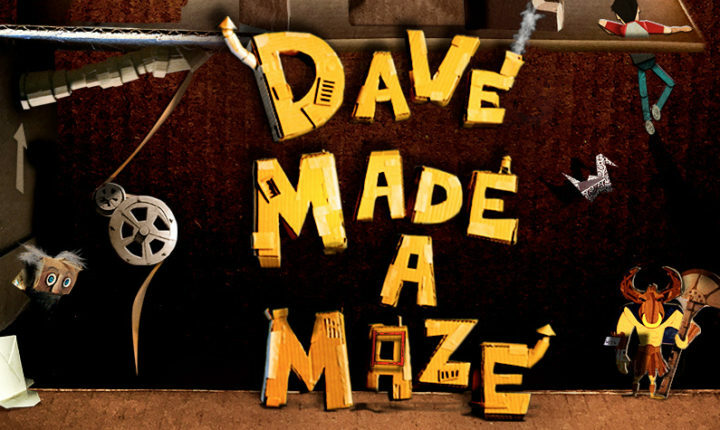 Say what you will about Dave Made a Maze but chances are you’ve never seen anything like it, and that it will be a movie people will want to talk about. So talk we did to the film’s cinematographer Jonathan Boal. So Jon, last time I saw you you were in Harrisburg, working on your own personal projects. Maybe that was 2011? Can you update me on what you’ve been up to since then and how you ended up in Dave Made a Maze? Tis a long and storied journey. Around 2008 I was stuck in the world of corporate video but knew that I didn’t want to spend the next 35 years making human resource videos. After the economic downturn, half of the company was laid off and the writing was on the wall so I decided it was time to make a change. Around 2009/2010 I moved to Philadelphia, bought an hvx200 camera package and started to shoot whatever I could, product videos, no-budget music videos and short films. I also PAed and camera assisted in the Philly area to expand my network. During this time period, I also shot my first feature film “Missionary”, which I also wrote and starred in. (I don’t recommend shooting a film and playing the lead, you have to have a really great stand in). My friend Lucas Fultz directed the film and it was a really scrappy effort, we worked nights and weekends and no one got paid. While the film didn’t get around to many festivals or have much of a life on the web, it was great exercise in storytelling and great way to cut my teeth. As you may or may not know, tax incentives drive much of where movies and TV are made and around 2010 PA lost its film tax incentive. This caused work to slow down in the town so I was looking for another change. I also learned that I was mostly interested in cinematography during my two years freelancing in Philly. Before that I had taken the one man band/Robert Rodriguez approach to filmmaking, which when starting out is a good thing, you learn every aspect of filmmaking, but eventually you need to specialize and become an expert in one aspect. So in 2010 I applied to AFI’s cinematography graduate program, got in and moved to LA. AFI was an intense two years but in that time I met a lot of great people and honed my craft. After graduating, I started working for the Academy (Oscars) and camera operating on TV shows (Behind the Mask, Amazing Race, The Unexplained), shooting music videos, short films and anything else I could get my hands on, basically what I was doing in Philly but on a larger more professional scale. Dave made a Maze came around when a DP friend of mine was between two features and chose the other one. I’m happy for the opportunity to shoot a wacky horror adventure comedy. Yeah, I distinctly remember you shooting Missionary when I was still in the area. It’s funny you mention that it was a learning experience, because some prominent directors actually recommend filmmakers get that first movie out of their system, which even though might not be stellar, will TEACH you how to make a movie in the first place. Was it an experience like that? Yup, I definitely learned a lot from that experience. The most importantly being that the best way to get something made is to just start doing it and take baby steps. There are lots of excuses to not make a movie, plenty of things will get in your way and give you perfectly rational reasons to quit. If you really want it you’ll ignore those rational reasons. For anyone who’s seen the movie, you can tell that space was a big issue while filming and something you pulled off was to make the movie feel big and not claustrophobic with so little to work with. Can you talk a little about shooting under such conditions and what the challenges were? So we made this film in a small warehouse in Glendale that only had time for two sets at any given time. To get a sense of the size of the space, Dave an Annie’s apartment took up about two thirds of it. What this meant is that we would leap frog from set to set. The art team would be working on one while we were shooting on the other, then as soon we wrapped the sense, we’d shoot a destruction shot (for the end of the film) and jump to the next set. All in all, we shot 26 sets in 20 days. Obviously this set of circumstances provides some logistical challenges! There was no way for me to pre light, or pre-block with the director, which with large ensemble cast in a tight space, takes some time to figure out. Luckily I had a great Gaffer and Key grip who were used to working on the fly and Bill and the actors were great about figuring out the best way to get “the Gang” through each part of the maze. From a lensing standpoint I knew I wanted the maze and the apartment to feel like two different worlds, so we designed some rules for each. In the apartment I stuck to focal lengths that match the way the human eye perceives (35mm and 50mm). I also kept the lighting a little more low contrast and used a tripod and dolly to keep us grounded in the “real.” We also wanted the outside of the maze to be its own character, which is why it spends a lot times in the foreground of shots and we dolly around it when ever a character is moving through the scene, it needed to be ever present. For this reason the first 15 minutes look more like a sitcom, but this contrast helps heighten the effect of going into the maze. Once we enter into the maze the shooting style completely changes. I used really wide lenses (mostly a 15mm) or telephotos (85m). 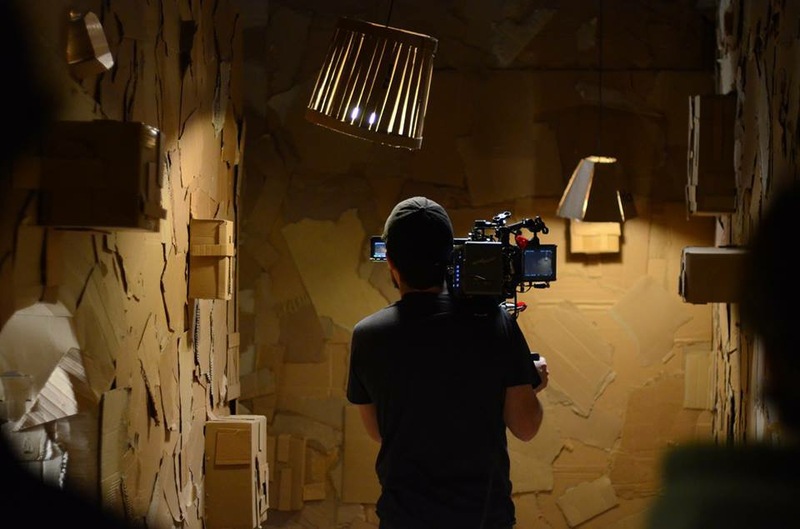 The wide lenses help make the sets seem larger than they actually were. In the maze most of the camera work was handheld, except for the occasional lock off and slider move for specific beats. We also kept a much higher contrast ratio inside the maze and pumped it full of haze. I wanted most of the interior to feel like it was lit through pin holes of light creeping in from real world. I would have art director Jeff White add the occasion hole to sneak a unit through. This gives the character a constant touch point with their ultimate goal of escaping. – In the “Hanna Barabera” room, the one with the bright colors and forced perspective. 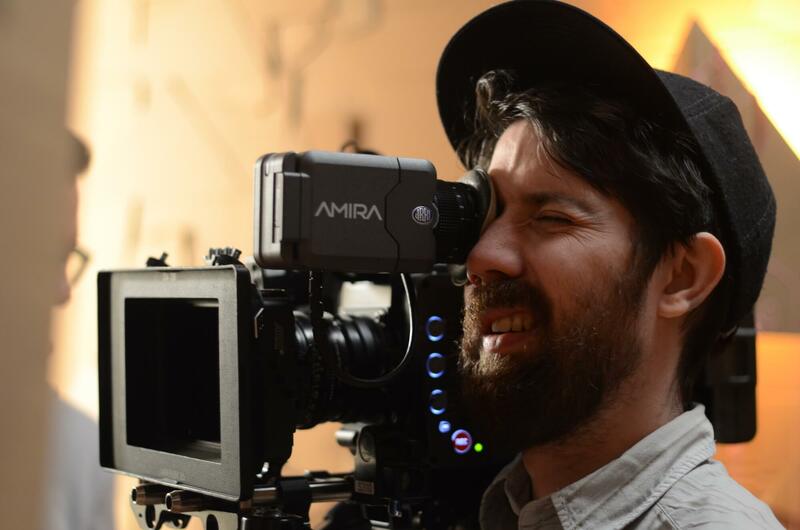 We shot the whole thing at a 16/22 aperture split. Everything from an inch to infinity was in focus, but what that meant was that I had to use about 10 times as much light. It was a hot day on set for the actors. -The chrysalis activation scene is all an in camera effect. Our Art Director made a fully functioning zoetrope that we synched to the cameras shutter. The movie comes in at just about 80 minutes, which is a little on the short side. I can imagine some stuff was cut to make the movie flow better in its final cut. Actually very little was gut. Only one short scene that we shot didn’t end up in the final cut. It was a 90 page script with some pretty snappy dialogue. We love home movie collecting here. Can you tell us if there’s a home released planned for Dave Made a Maze and what kind of bonus features we can expect? It’s released on Blu-ray and DVD in early October. I know there is 20 minute behind the scenes featurette and I think there is director commentary. Also the shirts are pretty cool. It’s customary here for us to ask bands what new music they’ve been listening to, so I’ll do the same with you but with movies. What movies have come out this year you’ve been really impressed with? That’s always such a hard question to answer, there is so much good content today that it’s like drinking from a fire house. This year I’ve really liked Logan, Okja and Dunkirk. Logan seemed like such a fresh take on the genre. I enjoyed Okja because it seems like Joon-ho Bong’s producers let him do whatever crazy idea he comes up with. Dunkirk was visually amazing but I don’t have a strong desire to see it again right way. I also liked Baby driver quite a bit, it was great to see some original summer fun. It may be sacrilegious to say, but I’ve been enjoying TV as much, if not more that movies. Fargo, Better Call Saul, Peaky Blinders, Game of Thrones and Ozark have all kept me extremely entertained. What’s next for you now that you’ve made it big in Hollywood? I hear the new Wonder Woman movie needs cinematographers. I have a long road ahead of me before “Big” but it’s nice to be taking steps in the right direction. I am a much more confident shooter than I was even three years ago. Bill has been taking meetings all over town so hopefully something comes together and we can make another wild adventure. In the meantime I’ve recently joined the camera union, I’m working on TV shows, webseries and docs and always looking for that next meaty project. Dave Made a Maze has a website.